The RBX374 has an alder body, a bolt-on maple neck with a 10-inch radius and a rosewood fretboard and 24 frets, and 34-inch scale length. 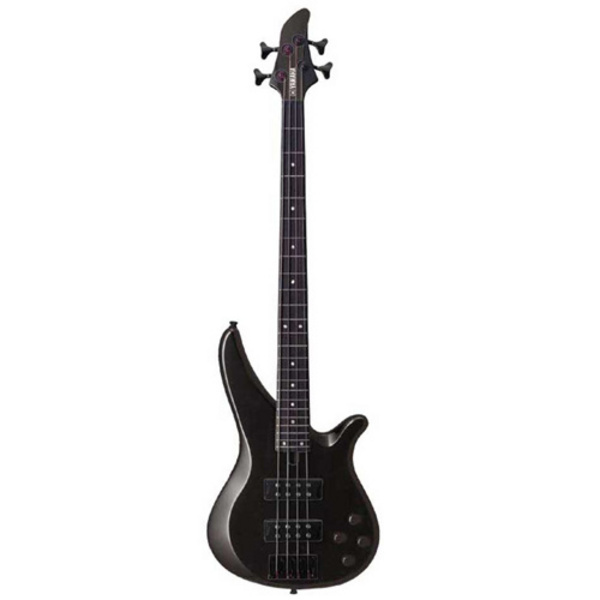 It has 2 Yamaha humbuckers, and active electronics which operate on a 9-volt battery and consist of controls for the master volume, bass boost/cut, treble boost/cut, and a pan-pot pickup selector. Last but not least it has a 3D headstock design which adds a nice touch to the bass’s aesthetics. Surprisingly, this bass sounds good for almost any style. The pickups are completely noiseless while playing, and they have a very full and heavy tone. By lowering the bass from the on-board equalizer you can get a sharp sound for slapping and popping, which also works great for soloing on the higher frets. By lowering the treble, the bass sounds dark and smooth, which is great for mellow music and jazz. This bass feels is comfortable to play. However at first the action was a bit high on it, which made slapping a bit stressful, but that was taken care of easily by lowering it so it’s not really a problem. The neck has a black matte finish which looks great and feels smooth. However, it’s a bit large since it has a 10 inch radius, so that might a be an issue for some players. Another thing is that access to the higher frets is a bit limited; the highest fret that could be reached comfortably is the 22nd but this isn’t that big of a problem. The RBX374 can handle abuse pretty well, and the finish can withstand some beating before it begins to wear out. The battery runs out quickly on this bass so it would be better to carry an extra battery when having a long jam session or playing live just in case. The hardware is firm and hasn’t shown any sign of rust, and the tuners provide great stability. To sum it all up, this bass is can cover anything for the reggae to metal, and will provide the tone and feel required for all styles. It’s definitely a catch.